A certain contingent of gamers would have you believe that video gaming is an artform unto itself: a medium for creative expression every bit as worthy of critical study and respect as film or literature. More conservative types suggest the day is coming, but perhaps hasn't quite yet arrived. But Lumines could well make the latter argument a little more difficult to support. Unlike most poster children of the "games as art" movement, Lumines isn't simply quirky abstraction or a furtive effort to fuse Hollywood sensibilities with occasional bursts of interactivity. It falls instead under the same banner as its predecessor, Tetris: a falling block game, somewhere between a jigsaw puzzle and a chess-like exercise in strategic visualization. And just as Alexei Pajitnov's brilliant creation was the killer app for Nintendo's Game Boy, Lumines embodies everything Sony hopes to achieve with the PSP. Like the system, the game itself is about convergence: A compelling synthesis of music, video and gameplay. Of these elements, music is definitely the most crucial, the pivot around which the rest of the game revolves. This probably shouldn't be too surprising, coming as it does from Sega's former United Game Artists star Tetsuya Mizuguchi. His previous creations Space Channel 5 and Rez also featured a brilliant, musically-focused blend of style and substance. With Lumines, Mizuguchi seems to be drifting further from the MTV music video approach of Space Channel 5 and more toward a sort of stylized minimalism. At its heart, Lumines is the Tetris concept simplified as far as it can conceivably be reduced. The falling objects are perfect squares divided into four smaller blocks of two colors; the descending units can be rotated, moved side to side and dropped. When four similarly-colored block segments are connected in a two-by-two arrangement, they vanish and cause any blocks above to drop down. Occasionally special blocks will appear which, when cleared, will delete all connected blocks of the same color. What differentiates Lumines from the standard Tetris-alike is its emphasis on the soundtrack. 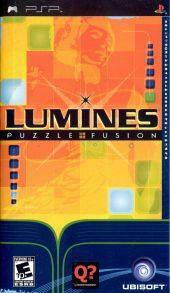 The best puzzle games have traditionally featured excellent tunes, but in Lumines the music actually affects the action. A scrolling line traverses the playing field in time to the current beat; when you create a two-by-two formation, the connected blocks are marked to vanish. However, they don't actually disappear from the playing field until the timeline (moving to the tempo of the song) passes through them. Timing your actions is a crucial component of successful play. Drop a block too soon and you might clear only a portion of your selected blocks; drop too late and you could lose a perfect combo opportunity. It's easily one of the most affecting interactive experiences to come along in ages -- the kind of game you continue playing in your mind long after you switch the system off. The focus on music adds to the experience on a number of levels. Beyond the obvious fact that the soundtrack, featuring Japanese acid jazz regulars like Mondo Grosso and vocalist Eri Nobuchika is profoundly excellent by any measure, the added element of the scrolling timeline adds a subtle touch of complexity to what might otherwise be something too basic. It also provides a sense of progress -- as you continue to play, one tune fades into the next, the timeline changes its speed, and the audio-visual elements transition from one audio-visual "skin" to the next. Perhaps most impressive is the fact that as you play, you effectively create the game's soundtrack. In addition to its specific tunes and visuals, each skin includes a set of sound effects triggered by the player's actions: Moving and rotating blocks, clearing pieces and creating combinations produces a layer of interactive sound that nevertheless manages to work in perfect syncopation with the backing track. 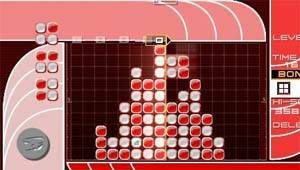 It's this subtle sense of control that truly makes Lumines so absorbing; you're not simply clearing blocks, you're laying down a groove over the game's fantastic rhythms and creating a light show to match. You are, in effect, the DJ for the Lumines experience, mixing a dazzling concert for an audience of one. If Lumines has a single significant flaw, it's the linear nature of the game's progress. Skins always appear in a set sequence. When you're on your twentieth attempt at working up a high score in Challenge Mode and you know exactly when each tune is going to bleed into the next, the predictability seems almost banal, which is especially unfortunate in such an otherwise exotic and style-oriented game. A randomization option to let the game cycle unpredictably through all the available skins would have been quite welcome -- after all, no DJ worth his salt would spin the exact same set night after night. Of course, it's easy to throw around terms like "art," "convergence" and "synaesthetic experience," but the true test of a game is something much more mundane: Is it fun? Lumines hit our offices with an addictive fury matched only in recent memory by Burnout 3 and Katamari Damacy. High scores became the key to bragging rights; editors on several occasions had to forcibly pry their subordinates away from the game to get them back to work. Yet Lumines also works on a level beyond catchy gameplay. 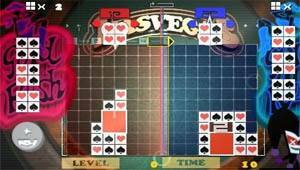 Q Entertainment has used the Tetris template to duplicate a lightning-in-a-bottle feeling equal in brilliance and addictiveness to the puzzle classic. While not the most immediately impressive PSP launch title, its depth and addictiveness make it likely to be the most enduring. Once the initial excitement of seeing PS2-calibre visuals on the go wears thin, Lumines will likely still be driving players to shoot for new scores and unlock that last elusive skin.